July’s saint may have a funny name but let me tell you, Saint Olha (890 – 969) was no joke. Just ask the Drevlians. They murdered her husband so she murdered them — 5,000 of them. Mafia style. Then she sent her own messengers to their rulers saying that she would be glad to marry. Just send a few more of your best and brightest and we’ll make the deal. When these men arrived all hot and dusty from the trip, Olha was all smiles. How about a nice hot bath? Once they were all inside the bath house, she locked the door and tossed in a match. It was in Constantinople that the indomitable Saint Olha was finally conquered. There she met the King of Kings and fell in love with him through the beauty of the Divine Liturgy. She returned to Kyiv a Christian. Olha set about in her energetic way to try to establish Christianity throughout the realm. She demolished pagan temples, built Christian churches, and sent to Germany for priests and a bishop. But Sviatoslav was now in charge and he was pagan born and most certainly bred. And so was nearly everybody else in the kingdom. When the German emperor sent St. Adalbert with other missionaries, the missionaries were killed and Adalbert barely escaped with his life. 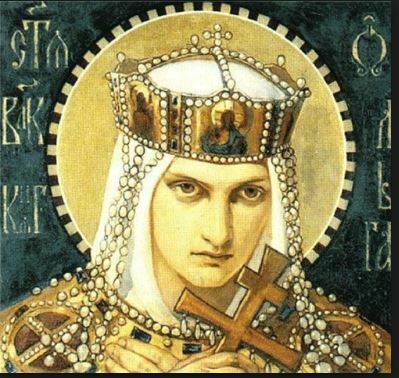 Olha’s prayers and pleadings failed to convert her son and kingdom but when she died, Sviatoslav did give her a Christian burial. One of the arguments in favor of the decision was that Christianity had been the chosen faith of his grandmother. Saint Volodymyr was then able to complete the spiritual reforms that Saint Olha had begun. He demolished pagan temples, many of which he had built. He built churches and monasteries. He established schools. His conversion was as real and sincere as that of his grandmother. Their spiritual descendants honor both of them with the title “Equal of the Apostles” for their zeal in spreading the Christian faith to the people of Kievan Rus. If Saint Volodymyr gets the credit for being the first Christian father of that people, then perhaps we can call Saint Olha their godmother. More Saints with Funny Names may be found here!